Luxchem Corp. was listed in year 2008 with half of the amount raised used to pay bank borrowings and working capital, while the remaining aimed to set up office in other countries for expansion and better product distribution. Luxchem Corp. has 2 core businesses under its portfolio which is trading of chemical material and manufacturing. Trading segment involves marketing and distribution of industrial chemicals while its manufacturing arm mainly produces unsaturated polyester resins (UPR). The trading arm has division in Singapore and Indonesia to provide chemical and related products to their customer in the respective countries. The group supplies fibreglass reinforced plastic, latex, polyvinyl chloride and rubber. Addition note is the group also supplies nitrile to glove producers such as Hartalega and Kossan to produce nitriles gloves. The group does not manufacture nitrile, it sources the chemical from Zeon Chemicals of Japan. Thus, the growth of nitrile gloves produced by those glove manufacturers will help to increase the performance of its trading arm. Looking back at the group’s pass year result, the group able to record a CAGR of 9.8% in revenue but somehow only managed to record a 4.3% CAGR in terms of net profit throughout the years. This can be explained by the declining trend of gross and net profit margins since 2009. As at the latest financial year of 2013, the net profit margin was only 3.76% which is not quite comfortable to invest in. The management team will have a hard time to sustain the bottom line if the operating costs or cost of the products suddenly go up with that low profit margin. In terms of dividend, the group maintains a distribution of 8.0 to 9.0 cents for the past 4 years, this translated into around 5.8% dividend yield based on recent price and also around 50% dividend payout. Further breakdown the group performance into its 2 core segments, trading division contributed mostly to the group’s revenue and net profit. However, the operating profit margin of the trading division has been declining consistently since listed from 7% to 4% currently. It’s probably due to intense price war with the competitors as well as the increased selling price from the suppliers. Else way, the revenue and operating profit of the manufacturing arm jumped around three to four fold respectively in the period of 6 years. 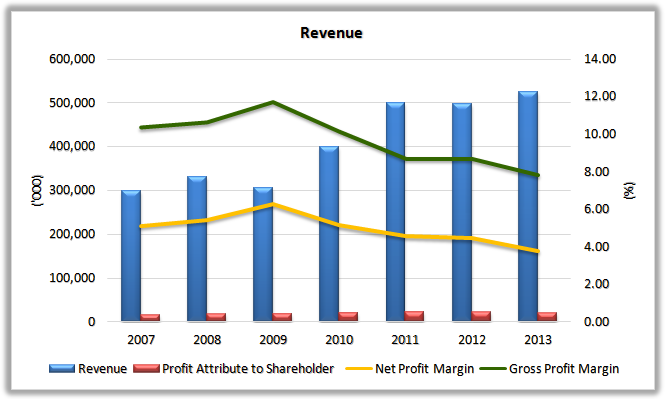 The operating profit margin was not consistent but at least higher than the trading division. The manufacturing division need to deal with the volatile price of the raw materials such as petroleum based styrene monomer and glycol that used to manufacture UPR as well as standard manufacturing costs such as labour and utilities costs. In terms of balance sheet, the group maintains a healthy position all this while. 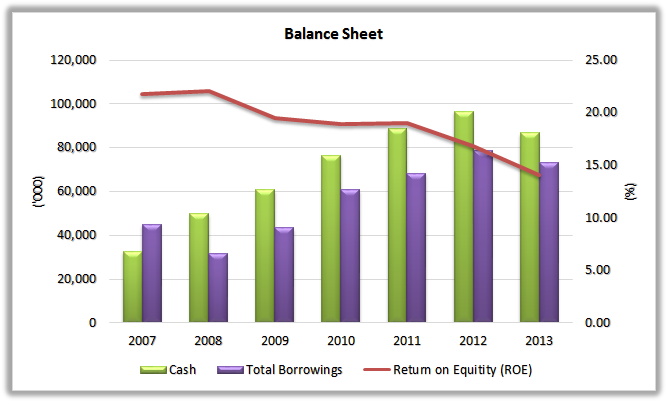 Current ratio is being maintained at around 2.0 while the cash on hands is able to repay all the borrowings. All the borrowings are short term at which mostly are bank acceptance. Cash per share is RM0.67 at latest quarter, around 50% of its market capitalization. ROE maintained at above 15 except last year and the alarming note is the ROE also showing a declining trend. The growth rate in net profit is slower than the growth rate in total equity attribute to shareholders. 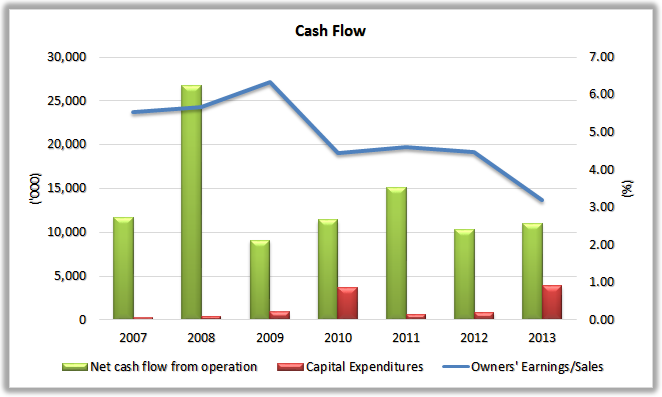 In terms of cash flow, the group maintains a low capital expenditures. It’s believed the trading arm does not require much capex due to its business nature, thus majority of the capex probably went to the manufacturing division. Thus, the depreciation and amortisation also quite low because of that. Net operating cash flow was highly inconsistent throughout the years due to the working capital changes and owners’ earnings/sales ratio fell below the benchmark of 5% too. Perhaps the reason the management maintains a high pile of cash in order to deal with any unforeseen circumstances rather to expand a little bit more aggressively. Based on the annual report, the inventories are mostly finished goods. The group managed to clear the inventory within a month as can be seen from the inventory turnover ratio. Cash in hands and trade receivables are mostly denominated in ringgit while the trade payable is mostly denominated in USD. So the strengthening of USD against RM will increase a bit of the group’s cost of sales. 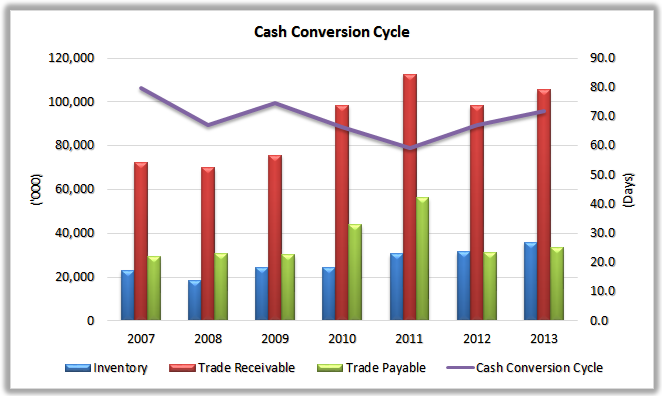 Cash conversion cycle is consistently controlled around 60-70 days. The group is leaded by the group's CEO, Mr Tang Ying See who is also the founder of the company. Along with his spouse, they're holding around 52% in Luxchem Corp. He has approximate 35 years of experience in industrial chemicals industry. But the bad thing is he is such a low profile person. Hardly find any news or articles regarding the company and its prospects. Apart from that, the chairman, Dato Haji Mokhtar bin Haji Samad is also the non executive chairman of Kosssan Rubber Industry. In addition, one of the substantial shareholders of Luxchem Corp, Chow Cheng Moey is the spouse of Lim Kuang Sia who is the managing director/ CEO of Kossan Rubber Industry. Thus, I think the relationship between the top management of Luxchem and Kossan will at least yield a synergy effect between the two companies. In conclusion, the management team have some work to do to improve the group performance especially the profit margin. The increase capacity of the unsaturated polyester resin plant in Malacca by 50% by the end of 2013 is a good step to begin with as the growth rate and profit margin for its UPR manufacturing is undoubtedly better but the result is yet to be seen. I think the next growth engine for the group is from the manufacturing arm with an additional 3-4 mils net profit can help to lift the group net profit to record high. yes, prospect is cautiously optimistic.